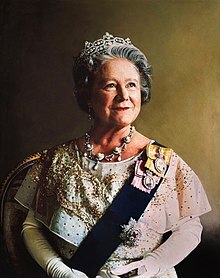 Elizabeth Angela Marguerite Bowes-Lyon (4 August 1900 – 30 Mairch 2002) wis the wife o Keeng George VI an the mither o Queen Elizabeth II an Princess Margaret, Coontess o Snowdon. She wis Queen consort o the Unitit Kinrick an the Dominions frae her husband's accession in 1936 till his daith in 1952, efter which she wis kent as Queen Elizabeth The Queen Mother, tae avoid confusion wi her dauchter. She wis the last Empress consort o Indie. ↑ The hyphenated version o the surname wis used in offeecial documents at the time o her mairiage, but the faimily itself tends tae omit the hyphen. ↑ "No. 55932". The London Gazette (Supplement). 4 August 2000. p. 8617. "No. 56653". The London Gazette (Supplement). 5 August 2002. p. 1. "No. 56969". The London Gazette. 16 June 2003. p. 7439. This page wis last eeditit on 17 Februar 2018, at 01:35.